Rice pilaf is an easy way to add flavor to rice. When I was a kid, we called it "good rice." At its simplest, rice pilaf is just rice that's cooked in broth instead of water. 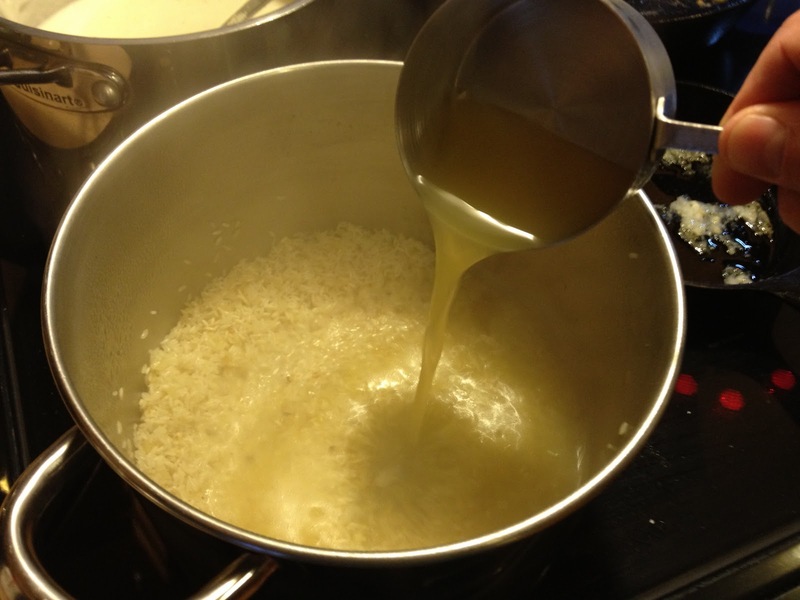 I like to start my pilaf with caramelized onion, which adds sweet, bitter, and savory flavors to complement the salt of the broth. I also toast the rice prior to adding the broth, which adds a nice nutty flavor to the finished pilaf. Begin by heating a medium stainless steel saucepan on medium heat. You can also use a dutch oven for pilaf. Once the pan is hot, add the oil. After perhaps 30 seconds, when the oil is hot enough to shimmer (but not smoking), add the chopped onion. Saute the onion for 3-4 minutes, stirring often, until the onion is beginning to turn golden. Add the rice and saute for another 3-4 minutes to finish caramelizing the onion, and to toast the rice a bit. Grind in some black pepper, stir things around, and then add the broth. Immediately add the bay leaves and thyme, stir again, and then taste the broth. The flavor of the broth is pretty close to what the finished rice will taste like (minus some of the herb flavors). Adjust for salt if necessary. Bring the water to a boil, and then lower the heat to a simmer and finish the rice just as you would normally (cook for another 10-15 minutes until the rice is tender). This, minus the herbs and plus a big glug of salsa, is basically the way I make Spanish rice (my mom always called the rice served with Mexican food Spanish rice, go figure). After reading this, I think I'll finally try and make "trucker's rice," something I believe I saw on an episode of Globe Trekker. It sounded a bit odd, but seeing it cooked simply over an open fire made me start craving it. Basically, it involved sauteed onions, chopped tomato, broth, and some bits of beef jerky added to the rice. Doesn't that sound like a job for cast iron? I make Spanish Rice in much the same way. I'm quite intrigued by "Trucker's Rice" and will have to try it. I agree that a cast iron dutch oven would be just the thing! Question : does it matter what kind of rice? I'm making this tonight along with your pan seared salmon and I can't think of another side. Maybe roasted asparagus?? Just about any kind of rice will do. I typically use basmati, but regular white rice would be fine. You could use brown rice as well if you had the extra time required to cook it, or even wild rice if you were feeling wild. The only thing I'd stay away from would be a sticky rice… since texturally, pilaf should be fluffy. Asparagus is a great side to salmon (and I'm a big fan of grilling or roasting it!). Green beans or a green salad would work nicely too. Derek, all I have is boil in a bag brown rice? And is fresh thyme ok to use? As long as you boil it in broth, it should work (I'd probably take it out of the bag). Fresh thyme should be great. Just add it at the very end just before serving.